The theme of identity pervades throughout Paul Karasik and David Mazzucchelli’s adaptation of Paul Auster’s City of Glass. From as early as page 7, where he comments on how he “had long ago stopped thinking of himself as real” (Karasik 7) and as Paul Auster the detective stands next to him answering the phone, it seems as if there exists conflict in discerning who David is. The theme of identity is tightly connected to both the motif of clothes the motif of eggs. Crucially, David is completely unclothed when he answers the call – and this is when we see Paul Auster the detective physically present. Yet when the second phone call comes, he is clothed and assumes the role of Auster, emphasized as the previously physical Auster does not appear. Unclothed David is vulnerably himself as his inner identities physically manifest whereas clothed David has to assume the role of his inner identity while harboring any others within. Clothes then, represents the way that David has to pretend to be only part of who he is. Much like clothes create an outer layer, Paul Auster is the outer layer that David uses. Nowhere is this assuming of identities more obvious than in his three encounters with Peter Stillman. He assumes the identities of David Quinn, Henry Dark and Peter Stillman (the son) in these three encounters (66-81). Other instances include his identity as author William Wilson (3), Max Work (8) and possibly scribbly face. In particular, in the phrase “in the triad of selves” (8) seemed to have allusions to the Christian trinity – the God, the son and the holy spirit. This suggested that David was as much individual as he was a constituent part of what makes him David. Being both individual and separate at the same time is a difficult concept, but is echoed throughout the book. In the ending however, David comments on how “Mookie Wilson’s real name was William Wilson… The two William Wilsons cancelled each other out” (Karasik 127) suggesting that this may not be healthy for humans. The fact that his identity as an author is William Wilson too also brings in the theme of language and it’s malleability. This becomes particularly important at the ending, where he unclothes himself in Stillman’s apartment and a panel shows the tombstone of Max Work, one of David’s inner identities (127). It emphasizes that the ‘cancelling out’ between Mookie Wilson and William Wilson has occured accordingly with Max Work – as Paul Auster the detective faded, so did another connected identity. It seems as if we only have access to this when David is physically exposed – when he has no clothes on. Perhaps this is why in page 26,Virginia Stillman is first pictured clothed, then naked. This visual change and play on motif emphasizes how David is seeing through her, but more importantly, that she is not seeing through him. “At any given moment, it was always both (127)” : Virginia believes that David is Paul Auster the detective throughout the entirety of the text. The theme of identity is emphasized by the motif of clothing, and David’s balance of identities is perhaps all but an extreme of what many of us go through today – we each have our ‘personalities’ with family, friends and in other social situations that define and change who we are. We may not have to take all of our clothes off, but perhaps Auster, Mazzucchelli or Karasik may want the reader to consider centralizing our personalities so that David’s sort of dissonance in personality won’t happen to all of us too. The formal preoccupation of film as a reflection of society – yet another thought experiment! Muvley talks about how formal preoccupations reflect the physical obsessions of the society which produced it. Thus, everything from the mise en scene to the camera movement mirrors the dominant attitude of the current society – which is the basis of the ‘male gaze’ where the camera is biased to the patriarchal society, perhaps representing the male human. How then would a matriarchal society alter the formal properties of film (you may choose to reference Carter)? Muvley further suggests that anything other than the male gaze can only exist as a counterpart. According to our androcentric culture, there is both male and female, but also human – what would a ‘human’ gaze look like? Finally, how does this differ from objective cinema, and perhaps (with reference to vertov) the traits of an increasingly objective ‘gaze’ in cinema? Muvley suggests that Hitcock’s Vertigo oscillates between voyeuristic and fetishistic fascination. We’ve discussed fetishistic in some depth now, but to my understanding, voyeuristic is represented by re-enactment of the original trauma (castration) and devaluation of the guilty object (film noir). In Vertigo, the trauma is Scottie’s fear of heights – what is the devaluation of the guilty object? In a patriarchal society, males have more power. It seems undeniable that this is reflected in film – from the use of height and blocking, to the compositional use of lines of perspectives or territorial space or the very subtle uses of camera movement. In Vertigo, lines of perspective often guide our eyes towards Scottie, he is often blocked in a way that he seems more powerful and camera movement is often done in a way that he is motivated to do something for himself, and others are doing things for him (In the scene with Midge’s painting, Scottie moves away from midge and the camera pans to follow him. The pans used with Midge are of her following him and giving him alcohol). A very simple answer to this is that a matriarchal society would have just flipped the roles – women would be emphasized as more powerful, men would have more subservient roles to women and would be increasingly objectified. Having read Carter however, this interpretation seemed a little too reductionist for me. Assuming that this matriarchal society came after today, the long standing tradition of Hollywood cinema, built and dominated by males, would not be forgotten easily. Particularly, it is Carter’s representation of female desire in most of the stories in The Bloody Chamber, but particularly in “The Bloody Chamber” and “The snow child” that really hit home to me the differences between male and female desire. Specifically, it is the social stigma behind the expression of female desire versus the social acceptance and in some cases encouragement of male desire. In “The Bloody Chamber”, mirrors are used initially as an avenue of access for the female desire, but eventually becomes yet another means to express male desire. In “the snow child”, male desire is presented without restriction and crudely, whilst female desire is shrouded in symbolism and metaphors. Thus, the “female gaze” would not be a complete opposite of the “male gaze” in terms of the formal properties of film, but to what extent it would differ depends entirely on the social context of the time. We further talked about related topics on the double standard of clothing on male and females, the sexualisation of female underwear, the distinction between literature and film and the way some objects (e.g. glasses) may have altered meanings in a matriarchal society. The next argument would be the differences between the “human gaze” and the “objective gaze”. In essence, the question came up because I was interested in what the traits of objective cinema would be, and if this would coincide with what the “human gaze” represents. In our androcentric culture, a “human culture” is presented with reference to taking the best or most necessary from the male and female cultures. In a scenario where feminism is at its peak and thus gender equality has succeeded, would film really still be as unbiased towards a male gaze? Realistically, the decades of patriarchy would play a role in creating bias in the film. However, it would seem that a “human gaze” in cinema is either something that we cannot yet imagine in our current situation, something we can only theorize based on scenarios where gender is not a social barrier anymore, or is unfathomable due to the technical complexities that come with it. The traits of the objective gaze however, was interesting – Using virtual reality, a 360 degree film of daily life may accomplish an objective human experience, getting rid of the strong associations of meaning that are attached to camera movement and mise en scene. Nevertheless, we must acknowledge that if not extremely difficult, it seems impossible to create a completely objective cinema (as Vertov’s film suggests – e.g. Berlin, the editor-wife at the end making stylistic decisions). Even in our scenario of a 360 degree film or daily life with no camera movement. The actions of the people, the structure of the architecture, the prevalence and message of the media may clue us into the bias between genders. Nevertheless, that’s just a theory – a film theory. These theories pose an interesting topic that seem to be applicable in many scenarios, but often should be taken with a grain of salt. The implications of this thought experiment however, are interesting in future generations of filmmaking. With regards to the second question – we briefly touched on the necklace being the devaluation of the guilty object. It is first Madeline’s, and then put onto Judie. It also seems to be a family heirloom of some sort. Yet the first thing that came to my mind was the concept of the mirror being superior to the self – and thus the original being devalued. In this case, I decided that it was one of the females that was the guilty object (fitting in with the male gaze objectifying women in cinema) but was not able to explore further. The relationship between Caligari and Cesare in Robert Wiene’s 1920 “The Cabinet of Dr. Caligari” is perhaps a reflection of the relationship between the Weimar republic and the German public. In 1920, proportional representation meant that no one party had enough power to pass any laws. Secondly, article 48 meant that the president theoretically had absolute power over the government and its people. Why does Cesare represent the German public? His rigid and erratic movements may have been a reflection of the similarly rigid German society at the time. His absolute obedience to Caligari thus represents the German society’s adherence to the president. Just as proportional representation meant that the German public could not harness any power that the system gave them, Cesare did not feasibly have any power, ultimately becoming Caligari’s pawn. Initially, this possible narrative criticism of the German society’s obedience under a supposedly democratic system suggests, at least from a Marxist interpretation, a change that was necessary. Yet the twist at the very end of the film seems to contradict this. Caligari is shown to be the head of the asylum, locking up protagonist Alan and is drowned with applause by the bystanders. It is as if Wiene is warning the audience that to step out of line like Alan is akin to mental suicide. Despite Alan’s best efforts, Caligari will always end up on top. This powerful twist at the end is reflected in the massive power that article 48 allows the president of the Weimar republic. Even if a German party had gathered enough votes to pass a law, the president could easily pass laws to change or remove it, as the president could choose what an emergency constituted. Nathaniel the metal menace – an automaton in human clothing? In Hoffmann’s 1816 “The Sandman”, the main protagonist Nathaniel falls in love with Olimpia – an automaton created by university professor Spallanzani and Coppelius-double Coppola. How did Nathaniel not find out earlier? Had robot technology advanced so far in 1816 that an automaton became indistinguishable from humans? Was Nathaniel just blinded by his humongous ego? Or perhaps was Nathaniel attracted to an automaton because he is one too? During his childhood, Nathaniel gets caught trying to find out who the Sandman is in his father’s room. As a result, Coppelius “ripped me [Nathaniel] open” and “unscrewed my hands and feet” (Hoffmann 47). The evocative imagery used to describe what happens to Nathaniel is often labeled a confabulation. This blog post will instead take an alternative perspective and explore the possibility that Nathaniel was killed in this incident, and Nathaniel’s father revived him as an automaton. Nathaniel’s father is described to have been working with or for Coppelius for a long time – there are multiple instances of the ‘sandman’ coming to visit. Presumably, Coppelius and Nathaniel’s father created automatons during this period of time. Nathaniel describes “human faces… visible all around” after Coppelius was seen hammering lumps. Moreover, the act of creating automaton seems to be either taboo or looked down upon – Coppelius and Nathaniel’s father take great care in hiding this from the family. The children are sent to bed immediately upon the arrival of Coppelius and the stove is disguised as a wall closet. It could be conceivable then that Nathaniel is then killed or badly injured for seeing Coppelius and his father in the act of creating automatons. Nathaniel’s father, in an act of desperation, revived or healed Nathaniel by giving him automaton parts. Why? Perhaps because going to a hospital would not only raise questions within the household but also with the government. Nathaniel wakes up when “A gentle, warm breath” passes over his face and “awoke as if from the sleep of death” (Hoffmann 47). The “warm breath” is paralleled by the breath of life that God breathes into man in Genesis. Furthermore the simile used in “as if from the sleep of death” may be suggestive of his death as a complete human. Importantly, Nathaniel is stuck in bed for “several weeks” (Hoffmann 48) because of a fever. Although much has changed over the last two hundred years, a 2015 article from WebMD states that in most cases a fever “goes away on its own in 3 days” and other sources state that most extreme fevers last 1-2 weeks. Instead, perhaps the several weeks was put into Nathaniel getting automaton parts. Why does Nathaniel fear Coppelius so irrationally? One possible explanation is that Coppelius was direct responsible for murdering Nathaniel’s father, possibly because he revived Nathaniel as an automaton. Nathaniel’s heavy preoccupation with his creator Coppelius may be grounded in his fear of disassembly. It would then make sense that Nathaniel falls in love with another automaton – Olimpia – and doesn’t see the emptiness or “lifelessness” that his colleagues see in Olimpia. Nathaniel claims that he was rendered color-blind because of his childhood experience. However, the faulty eyes may be a result of his father’s desperate attempt to give his son eyes without the help of Coppelius – the one seen with eyes the most. Lastly, at the very end Nathaniel attacks Clara whilst muttering recurring phrases in a robot-like way. With his father and thus his creator dead for so long, it wouldn’t been a surprise that the automaton portions of his body malfunctioned. Plato in today’s society – A thought experiment. These were the two questions that I came up with to prompt discussion for Plato’s “Republic”. Although the discussion went on a tangent, I record my initial train of thought below. What kind of society would we have today if Socrates’ censorship of heroes’ flaws or the god’s wrongdoings were employed? Plato’s need for control parallels a very dictator-style rule that would be frightening to many of us today. Particularly, his strict restrictions on poems and other forms of creative freedom and expression would cause outrage among individuals today. The significant effects of creating a perfect society (Plato’s Kallipolis) would then mean the eradication of all existing humans who do not conform to Plato’s standards. As such, it seems evident that Plato’s ideals are far too theoretical to be actually carried out. How true is this? In our current society, is there not already partial censorship of what type of person or body type is shown? Many studies have shown that exposure to television (and thus advertisements) have increased likelihood of developing depression and reducing self-esteem, especially in women. This warped ideal of a “beautiful” body today not only affects the viewers but also the models, many of which have to conform to unrealistic and possibly life threatening standards. Arguably, censorship “for the greater good” has been used in the past as well – think back to Stalin’s cult of personality. Even today, South Korea has strict censorship over almost all aspects of life including television, journalism and the internet. It is important to note that we are taking the extreme examples in an attempt to highlight what a Plato-esque rule may lead to, but to say that we have experienced a complete replication of Plato’s kallipolis wouldn’t be true. Perhaps we have, to some extent, already been under the heavy censorship that Plato depicts. However, Plato’s kallipolis could only be successful in a world without pre-existing ideals, but in our current society, the opposition from the masses means that Plato’s perfect kallipolis would never come to fruition. In Book 2, Socrates calls a city of producers – ones who only produce what is necessary – a “healthy city”. To what extent do our materialistic desires today make our cities “unhealthy”? Creating more than necessary perhaps can be attributed to an evolutionary psychological response: one example being the concept of feast or famine. Throughout the ages, humans have undergone famine – periods of time where food is scarce and have thus adapted so that they have ways to preserve and ration food. Thus, Plato’s suggestion to produce only what is necessary may then seem counterintuitive to the survival of the human race. Instead, Plato’s suggestion may emphasize that man is greedy. Only when there is more produce than necessary will there be conflict between humans as the ‘extras’ are seen as valuable luxuries. In Plato’s mind then, the conflict between men for resources is labeled “unhealthy”. There are many examples of this in the real world (money, education, food/water) and Karl Marx would suggest that the rich or the bourgeoisie managers have the power to maintain their hold over the majority of resources compared to the poor proletariats. Instead of this, Plato provides a more communistic approach, one where everyone shares. Even so, I have trouble seeing how this would be sufficient enough to stop the greed of man? Much research claims that the human mind is attracted to symmetrical figures, whether this is with architecture or other humans. Often, the immaculate and heavily detailed bilateral replication means that symmetry is associated with perfection. 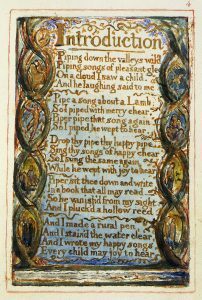 How does this affect the companion engraving to Blake’s illustration of “Introduction” in The Songs of Innocence? Although there doesn’t seem to be much content graphologically, the use of symmetry at first glance is evident. As an experienced engraver, Blake subtly alludes to the idea of perfection through the use of symmetry. The clear and even contrasting distinctions in colour – particularly between the dark green vines and the light blue background create clear barriers or divisions that are mirrored on both sides reinforcing this symmetry. Whereas artists may use multiple axis’s of symmetry to connote perfection, note that the use of symmetry here is only on a vertical axis due to the use of colours. As a romanticist that was often critical of religious institutions however, and one of the first authors that mixed both graphology and typography, Blake utilized his illustrations in order to forge a more subtle meaning behind his composition. A closer inspection of the illustration reveals that the illustration is not as symmetrical as it seems from the first glance. The top of the vines split in different directions and different tones are used to highlight them. Moreover, the figures drawn within the spiraling vines are distinct and individual from one another, further highlighting the sense of asymmetry. In my essay, I explain how the boy on the cloud is a divine being of some kind, and Blake uses colour in the introduction to criticize the linear view of the Gods. Blake may have believed that the Gods themselves should not always seem pure, as there are contraries in everything. This is reproduced in this illustration – not only does the “Introduction” have significant religious symbolism and may be Blake’s written commentary on the Gods, but the illustration also doubles as Blake’s visual commentary. In particular, the use of the vertical axis emphasizes the upward flow of the illustration, where upward is often connotative of heaven or the God’s domain. Moreover, the shift of colours from blue to white as the viewer’s eye moves upward reinforces this claim as white is often symbolic of purity, and thus the Gods. Whereas symmetry is symbolic of perfection, asymmetry can be symbolic of imperfection. Blake seems to suggest visually then, that the Gods should not be viewed purely as absolutely perfect and divine but also imperfect. Through the understanding of Blake’s beliefs during the context of production, we can unveil a more complex and contrary understanding of his illustration. Note: for some reason copying this from word doc. means I can’t really change the indentation – sorry about that! (Absolutely not late) Introductory blog post! I’m your resident enthusiastic exercise-freak that just so happens to be too lazy to exercise! I enjoy a lot of different sports: squash, muay thai, basketball etc. I’m particularly enthusiastic about badminton –I’ve been playing for a long time and always enjoy a challenge. Nevertheless, I’m (unless severely hungry/sleepy) almost always happy to join with interesting and/or physical activities – Hit me up! Currently, I’ve joined the esports club, badminton club, let go club, HKyours club and am planning to join the fencing club. Although I was born in Canada, I’ve lived in Hong Kong for a majority (17 years) of my life. Supposedly, one would assume that my Chinese (or Cantonese) would be at a decent level. I have however, enjoyed learning Spanish during middle school and Japanese during high school so much so that I’m continuing my Japanese studies in JAPN 200. My time in high school was dominated by the terror that many know by the name of the “International Baccalaureate”. Yet contrary to the traumatic stories and excruciating pain that many claim to associate with the IB, I felt like it was an enjoyable experience. Many of the subjects that I had taken in IB are currently reflected through my first year courses. These include SL ab initio Japanese, HL Film, HL Psychology and HL English Language and Literature which may contribute to my studies in JAPN 200, FIST 100, PSYC 208 and ARTS ONE respectively. In terms of program and career-choice, I’m completely set. Just kidding, I have no idea what I’m doing. I’m currently in a BA with an undecided major, hoping to get into possibly psychology in second year. Perhaps one of the things that I’m sure of in my first year is to do whatever sounds like fun. Before I left Hong Kong, my uncle told me a story about a village boy who left for the city. The moral of the story can be loosely translated to: “Don’t be scared to try, and don’t regret having tried.” Although there are a lot of situations that you could twist this to make me look bad, I believe this may encompass my current mindset – to try, and live life with less regrets. This may be particularly difficult for me because I happen to do things that aren’t very smart, but I try to make do. Finally, a little bit about my family. It’s been a big part of my life, maybe because my family is big. I have over thirty cousins, 13 uncles/aunts and even a nephew that’s older than me – at least according to weird Chinese family trees anyways – and my fondest memories in Hong Kong culminate from massive hot pot parties, large gatherings for birthdays and a lot of drunk relatives doing things that I would rather not talk about on my introductory blog post for arts one. I’m excited for what’s to come, and I hope to get to know you – yes, you fabulous reader you – more and more throughout the year.